What have I been up to? In short, I have lost my days to everything about games that has nothing to do with games. First, I am working out the details of Visible Hand Games' presence at this year's DexCon (which is less than a month away). For certain we will have a booth, but I am looking to do something splashier than that. Of course, I could not possibly compete with the Space Cadets Live event being held at that convention to promote Geoff Engelstein's (pretty awesome-looking) game. Hopefully there will be enough spotlight to go around so Visible Hand Games can make a splash at its debut convention. Why will VHG have a booth at DexCon? We will be announcing information about our very first release. (Which, depending on how other things proceed, might end up being my first published design.) I spent a recent Sunday training a couple of friends who have generously volunteered to help demo the game that weekend. Teaching them the game (and hopefully showing them how to teach others the game) was the only thing I've had a chance to do recently that was actually game related. Part of preparing to show off the game is making sure it is presentable. It is time to move from prototype to product. To that end, I have (probably) found an artist/graphic designer for the game. This is someone who came recommended by someone I trust. This artists' previous work also matched exactly the stylistic tone I want for my game. We don't have a final agreement yet, but the preliminary quote was quite reasonable and within my "Even if I fail to sell a single copy, I can afford to lose this much" budget. That budget, by the way, has to encompass not only the game's art, but all of my travelling and marketing expenses (such as convention costs) for the rest of the year. This has honed my decisions on how I go about doing this, as board games are an excellent business option for someone looking to lose a lot of money. One of those other expenses has been commissioning a new website design. This has thankfully been delivered. What I need now is to dedicate a weekend to crafting all of the images and content for it. Where I will find a free weekend is anyone's guess. 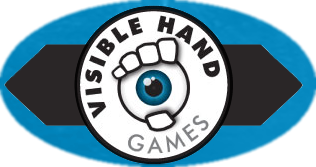 One of the things the new site will offer is the ability to signup for the Visible Hand Games newsletter. I plan on sending out one issue a month starting in mid-July. The hope is to keep engagement with any people I manage to make a connection with over the summer as I go to various conventions. The ultimate goal being to keep excitement high as more information comes out about the game. Pulling this off will require creating updates that both bring attention to the game without becoming annoying pitches. Along those lines, I have also tried to expand my social networking presence (especially on Twitter). However, I don't think I am getting the hang of it. I am not personally suited to the quick-reacting commentary seen on social networking sites. I can't figure out how to make my posts "relevant". Planning out my summer, I've hit a couple of bumps. After DexCon, my next planned convention is GenCon. However, while I thought I had a line on a room for the convention, I have yet to receive confirmation that it has been secured. This means I cannot book my flight as prices are beginning to rise. Also, the cost to rent a table there is way too high for someone who will not have product to see at the convention itself, so I would just have to set up in open gaming areas to show people the game. I'm fine doing that, but I need to get that hotel room locked down asap. I also have a huge gap in between GenCon in August and Metatopia and BGGCon in November. I am considering RinCon in Arizona in late September but have yet to hear concrete information about booth costs there. If you know of a convention in late August, September, October, or early November that won't be terribly expensive to have a presence at, please drop me a line. It's time for me to collapse, so I'll close by reminding you to come visit us at DexCon during the July 4th weekend in Morristown, NJ. Be one of the first to receive information about a game that I will be proud to have grace your table. Have you looking to EuroQuest in Pikesville, MD? It's Nov 1-4. Anni and I go every year. That's a great idea and perfect timing. I'll contact them immediately. Thanks!